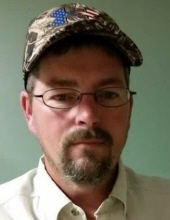 Terry Griffin, 49, of Rogersville passed away Friday, February 1st, 2019 at his residence. Visitation will be Sunday, February 3rd from 3-5 p.m. at Rogersville Funeral Home. Funeral service will be Monday at 1:00 p.m. in the chapel with Alex Bayes officiating. Burial will be in Higgins Cemetery with military honors. Pallbearers will be Dylan Davis, Bryan Brackeen, Michael Almond, Jeremy Grisham, David Cosby and Jason McGee. Terry was preceded in death by his mother, Brenda Joyce Griffin. He is survived by his wife, Leigh Ann Griffin; children, Amy Griffin, Laura (Dylan) Lovell and Emily; sisters, Kay McGee, Renee Williams, Denise (Scotty) Johns; brothers, Jeff (Melissa) Griffin; father, Wayne (Betty) Griffin and grandmother, Christine Blankenship. To plant a tree in memory of Terry Wayne Griffin, please visit our Tribute Store. "Email Address" would like to share the life celebration of Terry Wayne Griffin. Click on the "link" to go to share a favorite memory or leave a condolence message for the family.